Today, Pure Storage made several announcements: new product, new bundled solutions, and a brand-new scale-out architecture. These announcements were timed to coincide with Day One of their first-ever conference event, Pure//Accelerate, which I am attending. I’ll walk through these in order below. Those readers who are already familiar with Pure Storage’s m-Series arrays will recognize the m10 as a smaller model in the series. With the m10, Pure hopes to capture the branch and remote office market, as well as make themselves more affordable for smaller deployments. The m10 runs the same software as the rest of the m-Series arrays. Like them, it can be managed from mobile devices by the Pure1 software. The m10 is available with either 5TB or 10TB raw Flash storage space. With Pure’s inline compression and data deduplication, this gives it an effective capacity of 12.5TB or 25TB. The FA//m10 is fully-upgradeable to any other model in the m-Series. With all software included, and participation in Pure’s EverGreen Storage program, starting price for the smaller m10 configuration will be below $50K USD. 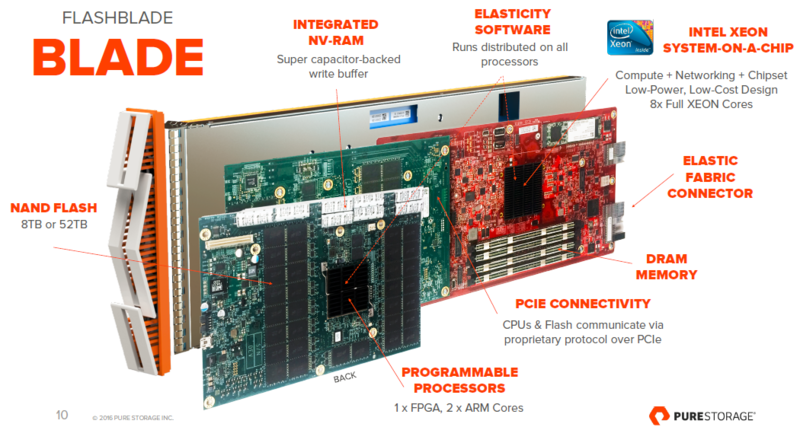 The Pure Storage FlashStack is an application-specific bundled solution. It is based upon Cisco UCS servers running the application, attached to a Pure Storage array, either the older FA or the newer m-Series. Cisco Verified Design (CVD) documentation for the FlashStack solutions are due out in the second half of 2016. The FlashBlade is Pure’s completely-new architecture. It’s a scale-out Flash system based on 4U chassis. Each chassis can be ordered with a minimum of 7 and a maximum of 15 storage blades. These blades are the first part of the excitement for me. They doing use SSD, but instead each blade can have either 8TB or 52TB of NAND Flash. This means that a fully-loaded 4U chassis will have 780TB of raw Flash storage with an effective capacity of 1.6PB. Each blade has eight full Intel Xeon cores running Pure’s new Elasticity software in parallel. Each blade accesses the storage on all the other blades in the chassis over the PCIe backplane. In addition to the hardware being a completely new architecture, the FlashBlade’s operating environment, Elasticity, is also brand-new. It’s designed with both scale-out and data services in mind, using an advanced metadata engine. Pure’s other storage arrays are block storage. 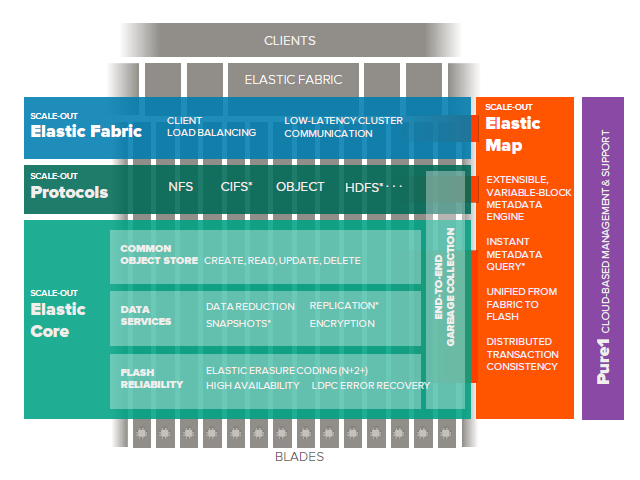 FlashBlade is designed for unstructured data, specifically files and objects. A logical view of the Elasticity design can be seen in the diagram below. Features marked with an asterisk are not available at GA, but are on the roadmap. Data is stored across all available blades using N+2 erasure coding. This means that a FlashBlade chassis can still serve data even in the event of the failure of two of its blades. For speed and efficiency, Elasticity uses low-density parity-check (LDPC) coding for error recovery. Elasticity can be managed by Pure1. At GA, FlashBlade will do inline data compression. Data deduplication will be added in a future release. At GA, FlashBlade can only be used in single chassis configurations. The next release will increase this to two chassis, with further scale coming in future releases. The FlashArrary//m10 will be GA in June or July of this year. The Lumria FlashStack solution is GA today. The MS Exchange FlashStack solutions will be GA by the end of March. Both FlashStack Mini solutions will be GA when the FlashArray//m10 is GA. The FlashBlade is entering a limited access Directed Availability program in the second half of this year. GA is expected to be before the end of the year. Here are my thoughts on today’s announcements. More smaller customers — and customers with smaller storage needs — are interested in adopting Flash solutions. The FlashArray//m10 is a great move to meet this need. The FlashStack strategy is a great idea. With more customers looking at converged solutions, pre-configured application-specific solutions will be very attractive to some customers. Originally, Pure had other plans to move from SSD to NAND Flash. One plan included developing custom boards to fit as much NAND Flash as possible into the form factor of a 2.5″ SSD SAS drive. (I got the opportunity to handle (and take apart) one of these prototypes today — very cool.) While this approach was not bad, I think the storage blade approach is better and more powerful. The FlashBlade has huge potential. I’m very excited about this product. The FlashBlade that’s being launched is an admittedly limited version of the product. Keep in mind that this a brand-new architecture, and a first release of the product. I can’t wait to see the next-gen FlashBlade with more of the planned advanced features included. What are your thoughts on the Pure announcements? Share them in the comments. This entry was posted in Pure Storage and tagged Announcement, Flash, FlashArray//m, FlashBlade, FlashStack, Pure Storage, Storage. Bookmark the permalink.